MET Opera Live! 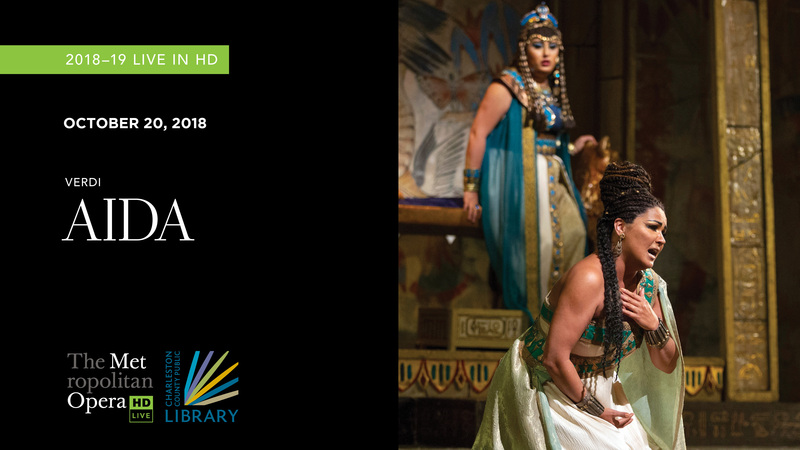 at Main: Verdi's "Aida"
Main Library - Join CCPL for another season of opera with the MET Opera! Between October and June, you can spend a Saturday at the Main Auditorium watching some of the most critically acclaimed operas being performed today. About this performance of "Aida"
In what should be a highlight of the new season, soprano Anna Netrebko sings her first Met Aida, going toe-to-toe with mezzo-soprano Anita Rachvelishvili as Amneris. Later in the season, a second star-studded cast takes over, with Sondra Radvanovsky and Dolora Zajick as the leading ladies.Tenors Aleksandrs Antonenko and Yonghoon Lee alternate as Radamès, and Nicola Luisotti and Plácido Domingo take the podium for the Met’s monumental production.